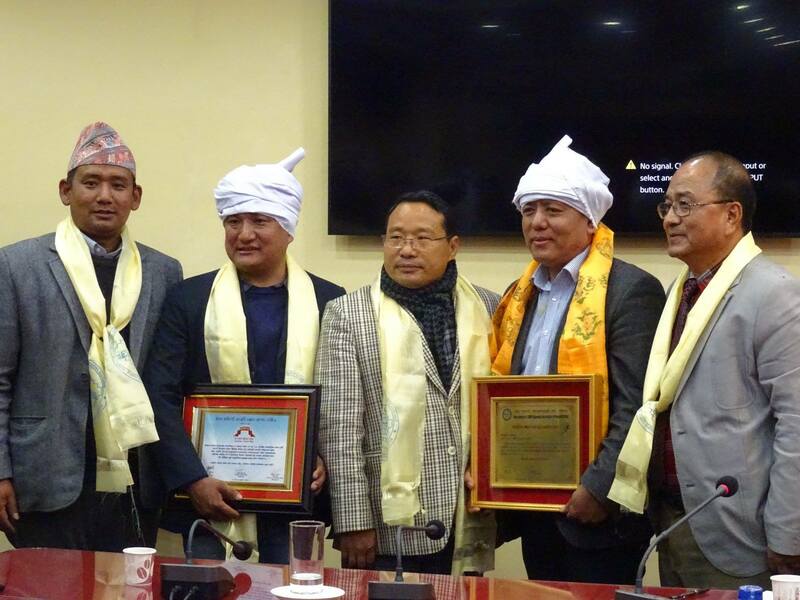 Two working indigenous journalists were honored with two different title awards by the hand of energy, water resources and irrigation minister Barshaman Pun. Gorkhapatra Daily`s Rajesh Chamling Rai was honored by “FONIJ UK JOURNALISM AWARD-2018” with cash rupees thirty thousand. Rai is central committee member of Federation of Nepali Journalist and former central secretary of FONIJ. FONIJ UK`s advisor and ex British Army Major Sonam Sherpa is the one to establish the prize. Likewise, Everest Times UK`s photojournalist Milan Tamu was honored by “TAMU AADIKABI HARKA BAHADUR GURUNG SMRITI PATRAKARITA PURASKAR -2075” with cash rupees 10 thousand and one. This prize is established by “Association of Tamu Gurung Journalist of Nepal”.